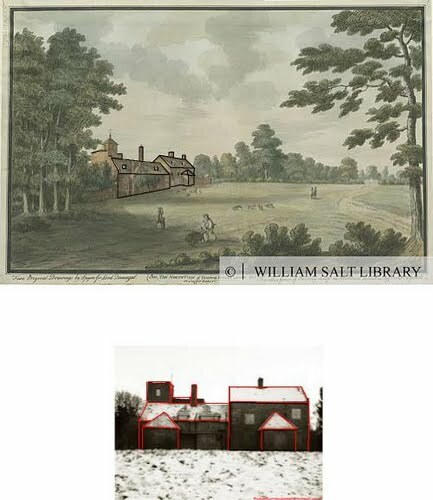 Going further back a building in the same location appears in William Yate’s map of Staffordshire, 1775(building at end of track on the lower part of the wood). It’s amazing the integral survival of a unique group of buildings in such a special place and it’s recording in a sketch from 1786! What’s more the details on the etching state the buildings go back to around 1750 and the artist behind it was J. Spyer who recorded many of Capability Brown’s projects. He has watercolors of Capability Brown’s landscaping at the nearby ephermeral Fisherwick estate, who’s owner the Marquiss of Donegall commissioned the above sketch of the woodhouse. The group of buildings has almost no information on the internet or in print and it’s difficult to know much more about the place. From Julian Woodward at The Hopwas appreciation society/ facebook I’ve gleaned that it was probably a hunting lodge built by the ostentatious Marquess of Donegall ( 1739-1799) resident at the bling Fisherwick Hall. After falling into debt it was sold to John Levett(1721-1799). 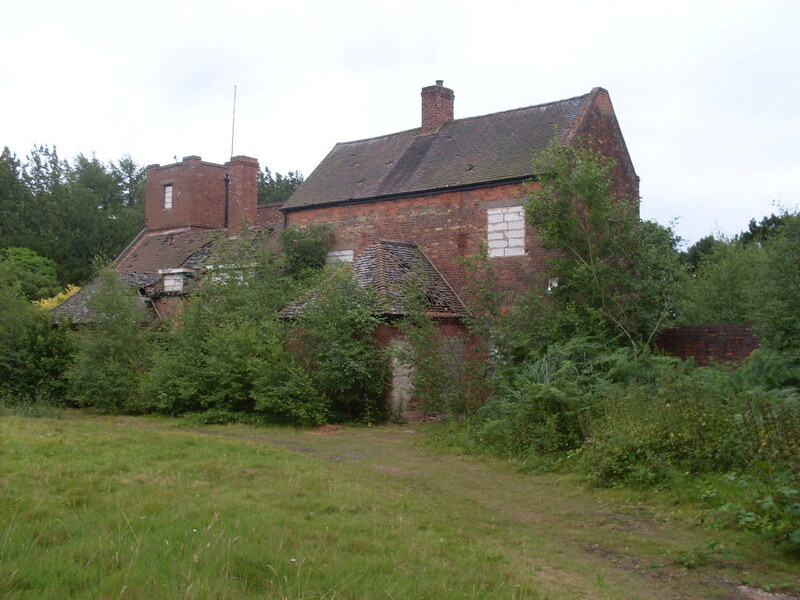 At this time Mr John Wood was living at the house working as a gamekeeper. 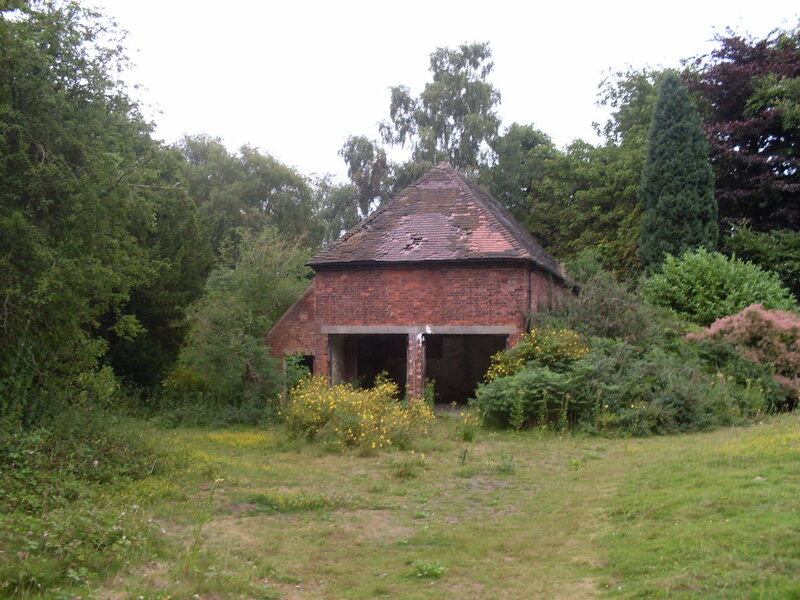 Hopwas wood was passed to his nephew Thomas Levett and from my own finding I can afirm that it was inhabited by Joseph Tomlinson, the woodsman and his family in 1834(source, history, gazetteer, and directory of Staffordshire,W, White) . So we can surmise it was the lodging of the woodsman/ gamekeeper. 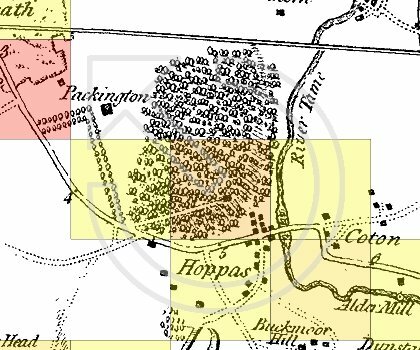 We know that Hopwas Hayes dates back a thousand years to Anglo saxon times, it’s status was royal and it was a number of Hayes in the area so it would likely have had woodsmen, is the woodhouse a continuation of earlier dwellings? I don’t know when it was abandoned and the reasons why, there are rumours that it belongs to the military or to Tarmak, it’s cordoned off and bricked up. 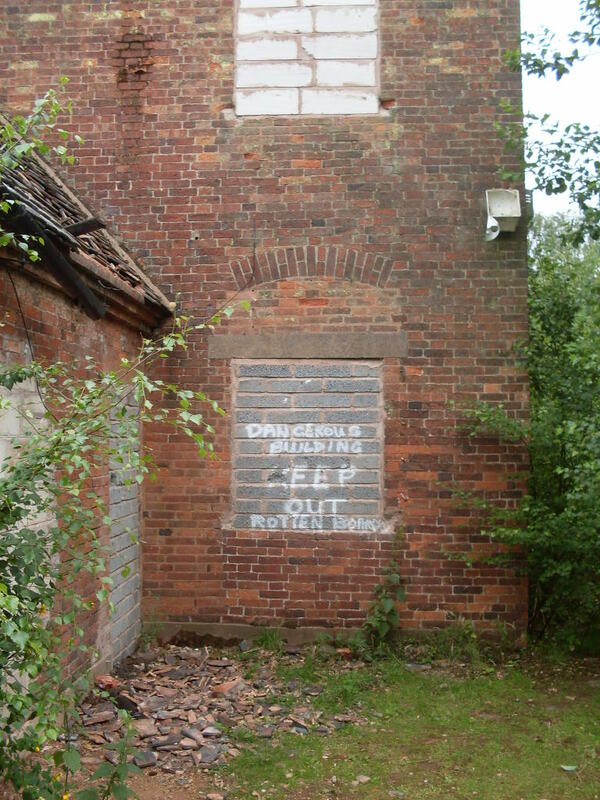 It’s not mentioned in any listed building lists or any official register which is crazy considering the uniqueness of the set of buildings and its history, the mystery grows….. Okay I’ll stop writing as I don’t think blog posts should be so long, should they? and let the photos do the talking. main entrance, covered in oil and barbed wire, special forces training to get past or just go round the side! notice the lawn or ‘green’ in the foreground is being looked after. free-standing structure in front of the main buildings, was it originally a barn? It’s had modifications and the two entrances correspond to it being turned into a garage. It’s got an add-on structure with an interesting object inside, see below…. Hello lorenzor , Snooper here from Midlands Heritage Forum. 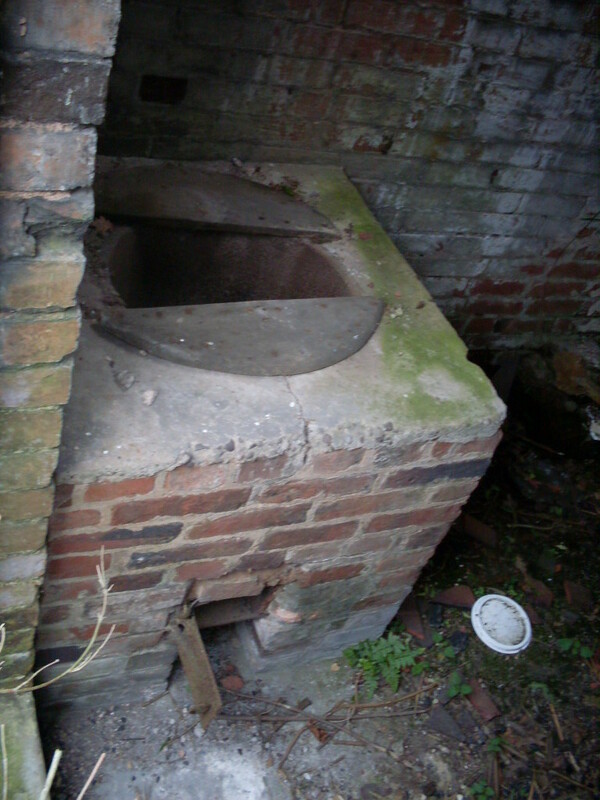 In one of your pics you are puzzled at the small room with the cast iron tub in /small door in brick work below. This is a very early laundry . The water was heated by the fire below inside the small door. If you look in the room it has a beam at about shoulder height with hooks on this was to hang the laundry to drip/dry. I hope my post on the heritage forums will be of some use for your blog. Regards Snooper. Thanks Snooper for solving the mystery. It’s fascinating that the materials for the laundry process are conserved from washing to drying, it’s a living museum on daily chores! I wonder what dates we’re talking about? Hi, I have just stumbled upon this page after googling ‘Hopwas Hayes Woodhouse’. I’m currently tracing some of my ancestors and according to the 1871 census my great, great, great Grandfather William Haimes was a gamekeeper that resided in the Woodhouse. I live in Greece so it’s unlikely that i’d have the opportunity to visit the house, so I am delighted to find these photographs & decriptions. Please tell me that the building is still standing & has not been demolished? The Bryan family of Drayton Manor Park, owned the house for three years, 1959 to early ’63, when they moved back to Drayton Manor. The house had no heating, five fire places which had to be set every day, five bedrooms and huge kitchen with three oven Aga range. The family owned only 17 acres around the house with views over the whole of the compass from the lookout turret which was used as a fire allert viewing lookout, it also offered a fantastic night view with a star telescope set up. 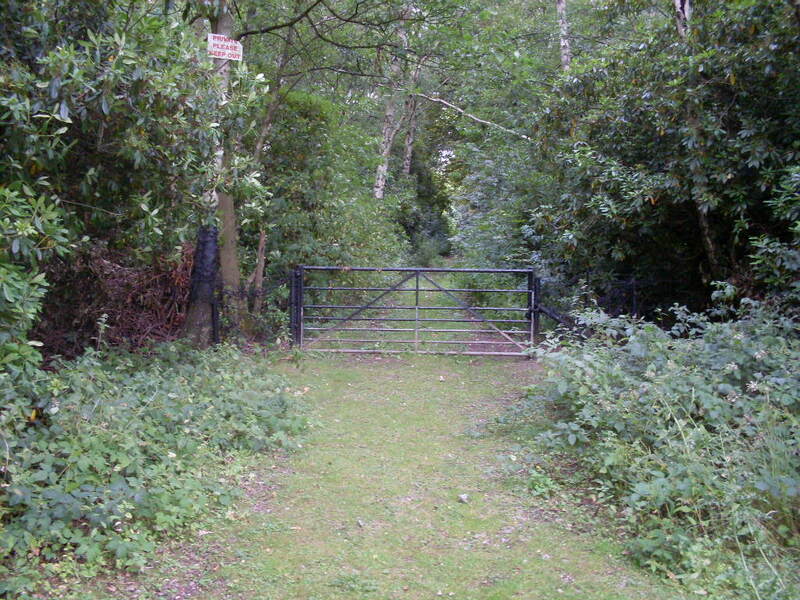 My memories of Woodhouse was the near 3/4 mile road where I learned to drive though the woods as a 14 year old. The woods were very busy at night with literally thousands of Birmingham Starlings flying in for their evening rest. The strong smell & mess created a problem with the Hopwas water storage tanks for the local water supply, the pump house is now a residence. We at the time could not buy the hill,of 250 acres as buyers were bidding for the gravel, as readers are aware the hill is now owned by a large gravel company. My father George was unwell when we went back to Drayton and I was not at work. I am now 65 this July, Dad is 92 and both of us remember our many enjoyable days at Woodhouse on Hopwas Hayes hill. I am informed that vandals had entered the house and it is ,I believe ,raised to the ground. I am sorry for not being able now to go back and see the wonderful views and the Rose garden my mother nurtured facing south. She would cry if she could as at 96 she is very ill. Still have memories of driving my 1934 Austin 7 up and down the road to Hopwas Church as this was our other road down to the village. Hope this is interesting. Colin Bryan. My Great Grandfather was woodman to a man called Levett I believe. I have a photo of the Woodhouse with the maid and great grandfathers daughters in the picture.His name was James Bell, he and his son James Robert Bell are both buried at Hopwas church. The local Tamworth paper wrote a interesting piece at the time of his death, he was in his 90s.